The show jumps ahead a little in time as Porunn gives birth. Scarred but seemingly recovered from her battle injuries, Porunn seems in better spirits but a handsy Bjorn can't seem to give his post-partum wife a break. She suggests to give Torvi, Jarl Borg's widow and current wife of King Horik's son Erlendur, a whirl to calm his urges. He does and their tryst is as romantic and as awkward as you'd imagine. Thus far, the Bjorn storyline has been the least interesting as he continues to endure his growing pains in the shadow of his old man. In Wessex, we get to know what kind of evil men King Ecbert and his son Athelwulf really are. We've known Ecbert to be the shadiest of characters who is always thinking three moves ahead and whose intentions always seemed calculated with his own best interest at heart. When we last saw Judith she had confessed to Athelwulf that she was pregnant but wouldn't say who the father was. This set Athelwulf off into a jealous rage. A rage he would use to slaughter an entire village of Viking farmers. A mass murder Ecbert had planned all along. To punish and humiliate Judith for her adultery, Ecbert orders her to be publicly tied to a stake. They ask her who the father is repeatedly. I'm not sure why she wouldn't give up Athelstan's name yet she persists until finally they torture her. It's tough to watch such cruelty, but she ultimately relents and says his name. A terribly awful thing to happen considering Ecbert himself seemed to goad Judith to follow her desires for Athelstan. As for cruelty of another kind, a tired and distraught farmer comes to Ragnar with news of the massacre at the hands of Athelwulf. He lost his wife and child plus another on his way back to Kattegat. Floki could not say "I told you so" fast enough to Ragnar. Ecbert was not to be trusted. Ragnar promises his revenge. Floki blames Athelstan who vouched for the king and counseled Ragnar on working out this agreement in the first place. Ragnar steps up and takes the blame as it was his call to make. Floki, ever the hater of Athelstan and Christianity, is beside himself with anger and is ready to leave Kattegat for good. Ragnar asks the farmer if he's told anyone about this and he says no. At once consoling the exhausted farmer with an arm around his shoulder at the loss of his family, Ragnar just as quickly wraps his hands around his neck and chokes him to death. Now he can be with family in Valhalla. A surprisingly callous move on Ragnar's part to kill this poor man to keep him quiet. Did he want to keep this quiet for now so he can attack Paris? Was he worried his followers would question his judgement as Lagertha's people did and dethrone him as well? The usurper, who by the way now has flowing locks and is ready to join Ragnar and attack Paris, Kalf is still a loose thread in the overall storyline and thorn in Lagertha's side. Still Ragnar, like Ecbert, is always looking ahead and setting things in place to fulfill his destiny. King Ecbert will get his when Ragnar decides it's time and not before. No farmer can derail his plans now. Meanwhile, Athelstan suddenly has a reawakening of his Christian faith. He affirms his devotion to God by re-baptizing himself in the harbor and throwing away his Ragnar friendship bracelet. Floki witnesses this and can't shut up about it. 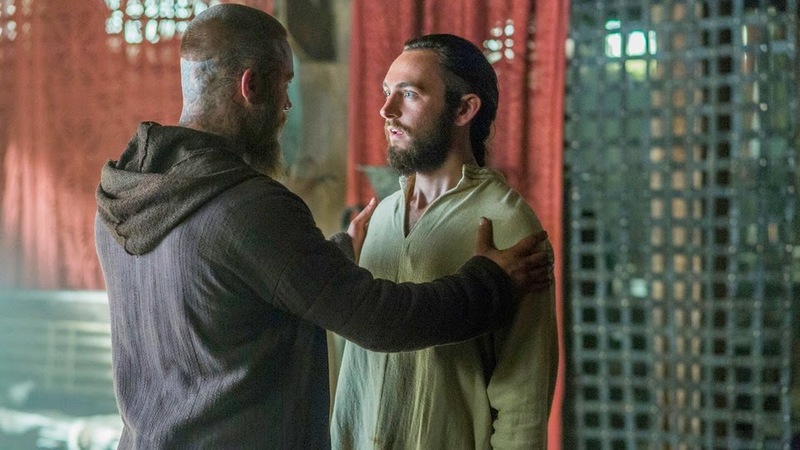 Nonetheless, Athelstan tells Ragnar he can't follow the Norse gods anymore and will be leaving. Ragnar insists he stays but as curious as ever he asks what was his God like. In a moment, this unlikeliest of bromances is explained. Since Athelstan, the former monk, was captured he and Ragnar have had this mutual fascination with one another and their religions. Ragnar always seeking his opinion and protecting him. Travis Fimmel and George Blagden demonstrated a special chemistry throughout the series. Fimmel's inquisitive portrayal of Ragnar and Blagden's understated observer and viewer surrogate. His character seeing the Northmen's ways the first time along with us at home. It was always interesting that Athelstan's advice carried so much weight with Ragnar. And his experience in Paris kept Ragnar engaged and enthralled with every word. It was much to the chagrin of others that this Christian had Ragnar's ear. No one hated it more than Floki. With the English settlement destroyed, Athelstan reaffirming his faith and the Northmen preparing to attack Paris Floki has had enough of his influence affecting the lives of so many. Religion has been a vital plotline in Vikings. The Vikings always seen as these savage pagans especially to the English. Yet they're as devout in their Norse gods as the English are to their Christian one. Which is all the more ironic considering the unholiest of actions by both sides full of betrayal, lies, and killings. Just in this episode alone. Floki sails back into Kattegat and stalks his way around the village like a deliberate dog heading home. In one scene, we're fooled to believe he indeed transformed into a dog to avoid detection by Rollo. It was a clever misdirect but a beautiful silent sequence with nary a word of dialogue. Floki finds Athelstan in his room naked and praising his Lord when the only words exchanged,"Floki," "Priest," it is a tense scene handled beautifully by both actors. Blagden smiling and welcoming his God again as Gustaf Skarsgard stands there scowling before attacking with a single blow. Athelstan laying there still and Floki smearing the monk's blood on his face, triumphant, appeasing his gods and removing the perceived threat to the Viking way. Jump to Ragnar towing a body wrapped in cloth by horseback through the forest going higher and higher the hills by the shore. At first it seemed he as disposing of the farmer he killed but as he speaks to himself essentially we learn it is Athelstan's dead body. It's a solemn scene. Just Ragnar and Athelstan on the highest spot in Kattegat. A grave ready but Ragnar eulogizes him declaring he never knew what a martyr was and still doesn't. He chose this place to get his friend as close to God as possible. He places Athelstan's crucifix around his neck and plants a simple cross to mark his grave on the ground. There is certainly change ahead. What will be Floki's consequences for killing Athelstan? Will the Northmen deal with Ecbert first or attack Paris? How long before Lagertha gets her revenge on Kalf? Will Ragnar and Aslaug's marriage finally collapse? Creator, producer and writer Michael Hirst has once again put together another compelling season that just keeps getting better.